PODS – Aadi Defence Pty Ltd.
PODS are collapsible portable storage solutions in three different sizes that are convenient, cost-effective and solve a wide range of storage needs. 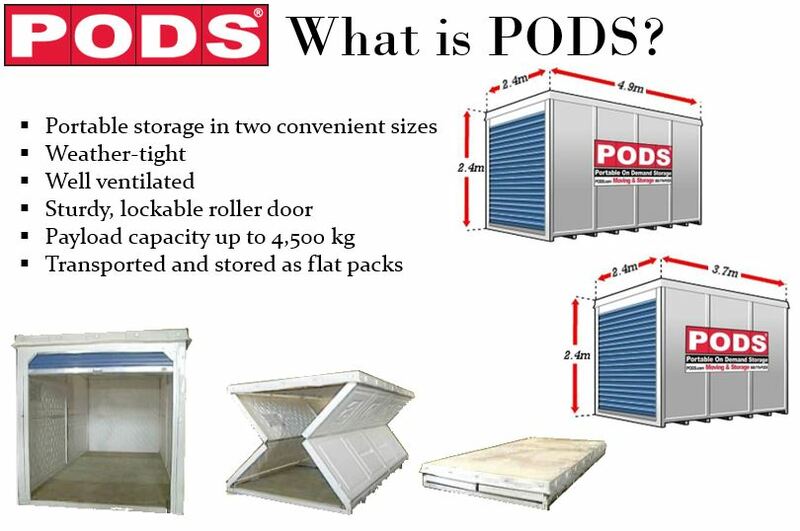 PODS is widely used for moving solutions and as alternative house and business storage solutions. In the U.S.A; agencies use PODS containers during facility renovations, for onsite storage, relocation of employees and for personal storage and even temporary housing during disaster relief situations. To establish a relationship with the PODS team and develop a business case for the use of PODS within Defence. The PODS technology is a unique and versatile solution for storage with direct relevance to Defence. The storage solution is currently being used in a variety of commercial applications in the U.S.A and Australia. The portable storage containers are easy to transport and when empty can be flat packed for transport; reducing costly transportation challenges. The containers are versatile, easy to move once onsite, strong, secure and weather resistant. There is a wide range of potential applications within defence; logistics for deployment opportunities, storage solutions at defence facilities, relocation of personnel and disaster relief. PODS achieved sales into the Australian Department of Defence. An aggressive business case for the use of PODS storage for a variety of defence applications; developed by aadi Defence. Identification of potential end use and development of user needs requirements; developed by aadi Defence. Development of supporting technical reports including testing data to justify the benefits of the PODS system; conducted by aadi Defence. Connect with key decision makers and end users; facilitated by aadi Defence. Innovative Technologies: We are interested in innovative solutions that can be applied to the field of defence; however this does not limit the technology from being used in non Defence related applications. We believe this innovation is a perfect fit for defence where deployment applications require portability and practicality; both essential criteria for an efficient logistics plan.